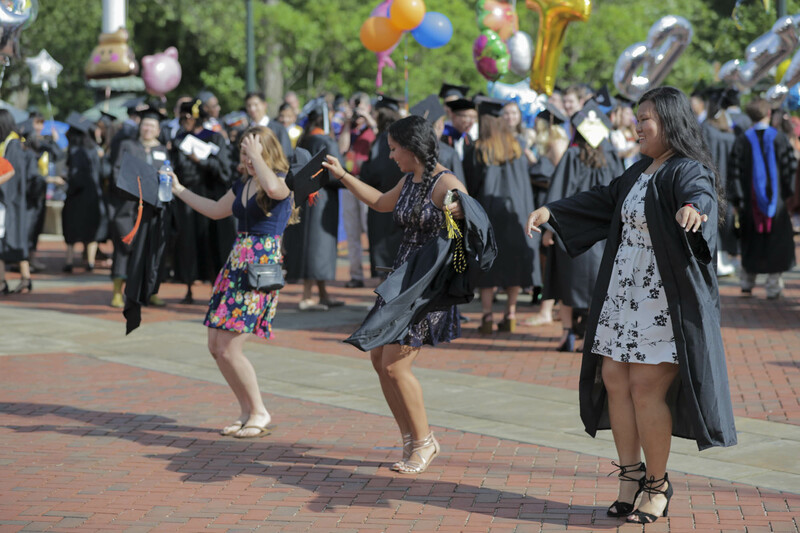 After two days of rain, the sun shined brightly in Charlottesville on Sunday, allowing graduates of 10 University of Virginia schools and the Data Science Institute to fully soak in one of the most time honored UVA traditions: Walking the Lawn. 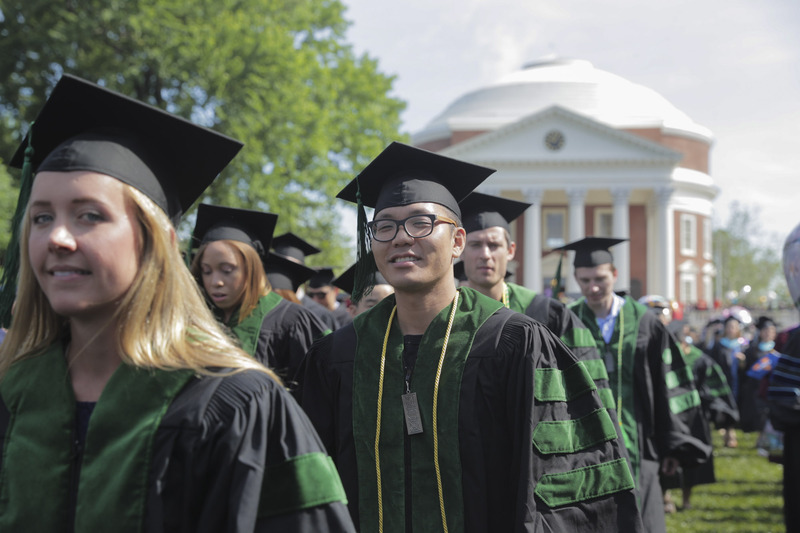 UVA awarded 1,999 graduate degrees – including 1,800 master’s degrees and 150 Ph.D’s – as well as 1,503 baccalaureate degrees and 457 first professional degrees. 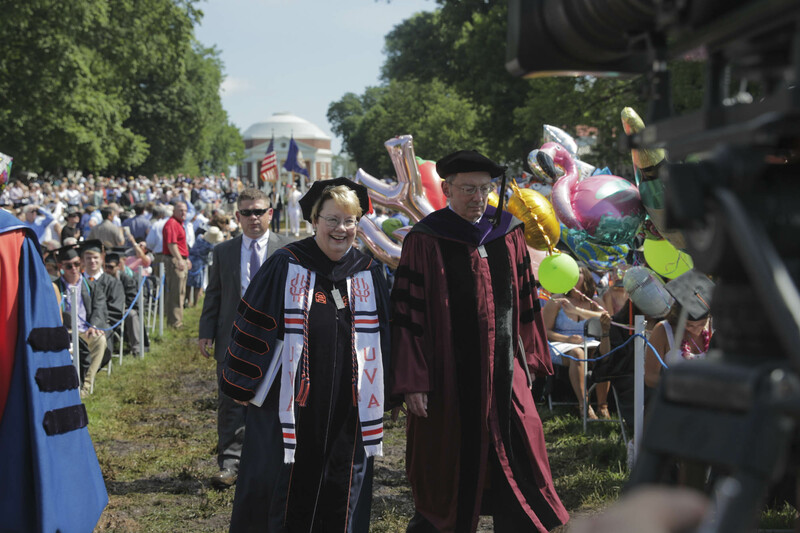 UVA President Teresa A. Sullivan, who is stepping down in July, presided over the 189th Final Exercises, and, in the custom of outgoing University presidents, gave the commencement address (which she also did on Saturday for graduates of the College and Graduate School of Arts and Sciences). University Rector Frank M. “Rusty” Conner III spoke before Sullivan’s address. “Know that your whole life has prepared you for this calling – you are ready,” Conner told the graduates. “Remember you chose this University for a reason – a reason that becomes even clearer as you venture forth in the world.” Read his full remarks as written. Conner then introduced Sullivan, whom he said has made a “Herculean effort” to improve the University. A day after sharing a story about a British explorer named Sir Ernest Shackleton – who survived a harrowing shipwreck – Sullivan spoke about the exploits of Albemarle County native Meriwether Lewis, who was commissioned to explore the western part of the United States by then-President Thomas Jefferson. “He would have fit right in with you – the Class of 2018,” Sullivan said of Lewis, who the University named its new leadership institute after four years ago, “because he shared many of the qualities that you possess, as individuals and as a class. Lewis spent months preparing for his journey, but still ran into hardships: unexpected geographical barriers, extreme weather, treacherous waterfalls and massive grizzly bears. “Like Meriwether Lewis, you will encounter setbacks and surprises in the ‘real world’ after graduation,” Sullivan said. Sullivan advised the students to lean on their curiosity and resilience, the latter of which she said they had already exhibited during their time on Grounds in persevering through crises such as a recklessly reported Rolling Stone article that was later retracted and the attack by white supremacists last August. “You will need to take this resilience with you into the careers and communities you will enter after today,” Sullivan said. See more photos from Sunday at Final Exercises. Moments later, graduates from each school – with rays of sunlight beaming down on them – rose to have their degrees officially conferred upon them.